This summer I’m learning about the Moro Reflex. This is the startle reflex that newborn babies have which causes them to fling out their arms (and legs) and then immediately pull them back in. If you’re a parent you’ve likely seen your baby do this. It’s totally normal and natural and occurs when the baby feels like it’s falling. Under normal circumstances this reflex integrates itself and disappears at about 4 or 5 months of age. If the Moro Reflex is not properly integrated into the brain (I’m still not sure what that really means) it can cause overreactions in the individual affected. There’s a pretty good explanation here. My eldest daughter (she’ll be 8 in September) has been “diagnosed” as retaining this Moro Reflex. Emma, who will be going into grade 3 this fall, has issues with her printing. This has come up at school (obviously) as it is now affecting her grades. She has great ideas and understanding, but it’s hard for her to get her thoughts on paper in the time provided. As an elementary school, and high school, overachiever myself, this is hard for me to grasp. Some of her grades are low because printing is very hard work for her. She’s also left handed which means I can’t help her adjust her printing because I don’t understand the mechanics of being left handed. Emma has had an assessment with the Occupational Therapist provided by the school, and has been deemed in need of some sessions. They hope, with some work, to improve her printing. She prints bottom to top, right to left. This is bad. She also uses too much pressure and takes a very long time to get her thoughts down on paper. We’re almost at the point of having her get a computer supplied by the school for her to do her long-form style work (essays, projects, etc.) That’s going to be a conversation before Christmas this year. Now that it’s summer I was concerned that she wouldn’t really be working towards helping herself and her printing since we can’t spend a lot of at home time together. With both parents working there isn’t as much time for “homework” style work. Luckily my fabulous daycare is helping out and having Emma (and the other kids, Rose included!) do the worksheets we were sent home with as a summer package. This is amazing to me – I’m going to be so sad to say goodbye to our long-time daycare folks this fall! Anyway, I sought out a local Occupational Therapy for Kids outfit here in Kingston. I know the woman who runs it (it’s my boss’ wife.) Make Way for Me has taken Emma on and we’ve paid for a 6 week course there. It’s amazingly different than what they were doing with her at the school. Like anything, you need to start on a good foundation. When you talk about development (emotional, motor, sensory etc) you need to assess the really basic level skills a person needs to exist. The 5 senses and an understanding of your body is where it all starts. By giving Emma a few basic “tests” the therapist was able to see right away that Emma has this Moro Reflex still in her young body. So now we are working toward straightening that out and getting it incorporated the way it should have been when she was a baby. We now have a few easy exercises she’s to do every day (a few times a day if possible) to help this Moro Reflex get sorted out and stop interfering with her day to day motions and movements. I know it sounds kind of weird that we’re doing all this because she has trouble printing, but I believe that if we can integrate this reflex it may help her have more focus and better coordination. All these factors are very important to school work, printing included. 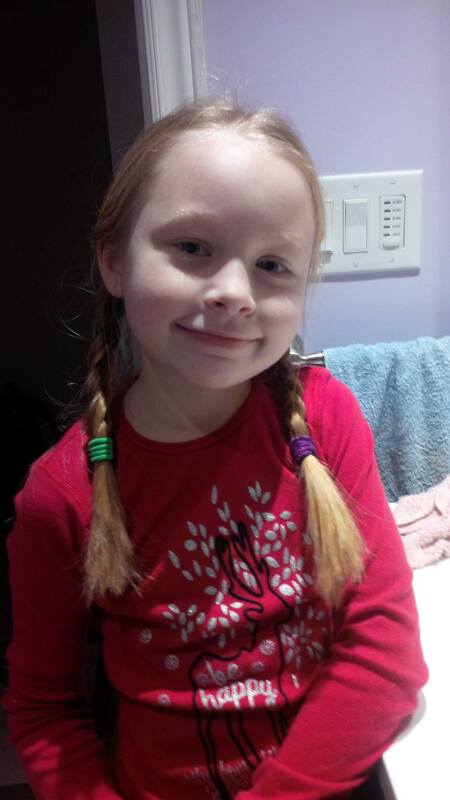 Emma is a very smart girl and I want very much to help her have an easy learning experience at school and elsewhere in the world. Read my follow up post My Child Struggles with Developmental Delay. I touch on some of the strategies Emma uses at school to help keep her focused. The school has been great at helping us find solutions, and extra help, so Emma feels comfortable in class. Do you have an experience with Occupational Therapy in general? So far I can see that it can be of immense benefit for kids who are struggling with any aspect of their lives. 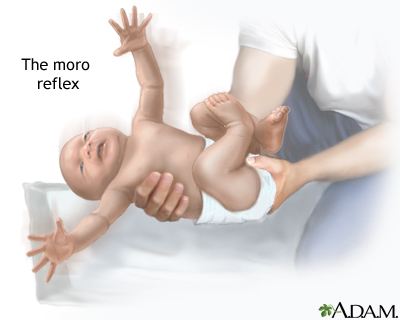 Have you come across this Moro Reflex, or have anything else to share about child development? Please comment with your story. I’m struggling a bit with the “this is not your fault” mom guilt. I know there is nothing I should have done differently with Emma, but still the feeling persists. I had hoped my kids would love school like I did, and not struggle along. There’s a long road ahead of them so I hope we can provide both the girls with the tools the need to be successful in school and in their lives. Hi Katherine! I do mean physically printing – she pushes too hard with the pencil, her fine motor skills are delayed,she’s VERY slow went printing, she lacks focus (sometimes – I see this getting better!) and she makes a few letters backwards still, even though she’s 8. Her teacher last year told us she is so bright and has so many great ideas but her marks are low because she can’t get her words out in the time provided so she writes one or two sentence answers when they’re looking for a paragraph or two. There are so many different delays and sensory issues that can be addressed now – it’s amazing the accommodations they can provide at school. I’m actually planning to do a follow-up post to this one soon with what we’re doing now and how school is going. Thanks for commenting! I’m always happy to hear others have had positive experiences with OT – I think it’s a really great and under utilized form of therapy. Although it’s also quite expensive. Emma loves going and I do see improvement so we’ll continue for a while. Thanks for the comment! Well, you probably know I have two children with autism… I do experience bouts of “mom guilt” but mostly I know that’s rubbish. You can’t “cause” anyone to have autism, it’s a genetic glitch. As is Moro Reflex. And I will always be their strongest advocate and biggest supporter. OTs (as well as physiotherapists, music therapists, social skills teachers etc) are a common “side effect” of autism as many of the kids have fine or gross motor skills delays. My kids have both spent time in OT, Liam for fine motor skills (small delay, which is totally gone now–he has great printing) and Rowan for sensory integration techniques like deep pressure. Our OT was fantastic but your mileage may vary. In Alberta most programs like this are funded so happily we’ve never paid for OT, but I think her going rate was $150/hr. So yes, very expensive. Hoping your daughter sees good results. It’s too bad the governments don’t fund more therapy style healing. There is such an improvement in Emma after the sessions we’ve had. I’m very glad to hear that in Alberta you are able to get the support you need for your family! Thanks for the comment Melaena! Thanks for sharing Darlene. You are so supportive, I love hearing from you! I think you are amazing for raising your 3 boys back when there was so much more stigma around autism and developmental delay. You are an amazing mom too!